A superb package of tones. Fender Collection 2 for AmpliTube is the second officially certified collection of Fender amp models for the computer-based version of AmpliTube, the standalone amp sims and effects program that can also be used as a plug-in in DAWs, inserted into a recording/playback track. The first AmpliTube Fender featured 12 amps, but this one has seven and concentrates on the reissue amps of the ’57 Custom Series: the ’57 Deluxe, ’57 Champ, ’57 Pro, ’57 Twin and ’57 Bandmaster. You also get two modelled vintage amps - a 1953 Bassman and a 1965 ‘blackface’ Super Reverb. An add-on to existing versions of AmpliTube, Fender Collection 2 can be purchased in one of two versions. For $/€179.99, you can add it to the free Custom Shop ‘starter pack’ version of AmpliTube or AmpliTube 4 if you already have it. For $/€275.99, you can buy it as a Power Duo Bundle with AmpliTube 4 and its included nine amp models. For anyone unfamiliar with AmpliTube, all versions are based on a basic signal chain consisting of a tuner, a configurable pedalboard, amp head, cabinet with mic’ing options, and studio-style rack effects processors. There are plenty of routing options for constructing your tone as you can combine two separate complete signal chain paths - that’s two fully configurable rigs with up to 32 simultaneous effects. 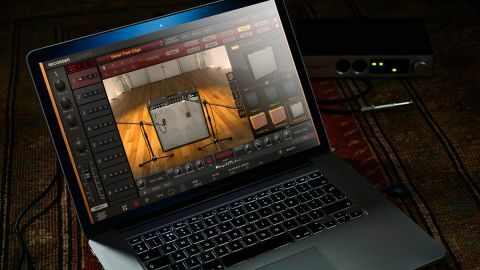 The full version of AmpliTube 4 adds a Cab Room module where you can change the type of virtual recording space, choose and place two mics in 3D in front of the cab, as well as use two room mics, swap speakers in some of the cabs and fine-tune the mix of cab mics, room mics and DI signal. There’s also a post-amp effects slot and utility items such as an eight-track recorder and four-track looper. IK Multimedia is using its new ‘Dynamic Interaction Modeling’ for Fender Collection 2 and that seems to have had an effect because these amps are some of its most realistic yet, with great response to playing dynamics and guitar volume, noticeable on the cusp of going from clean to dirty. While you might expect the great range of classic Fender clean tones that’s here, there’s also some very natural transitions into fully driven tones. All of the amps have their own character and it’s probably fair to say that the various flavours of tweed are suitably covered via the ’57 models, from the simplicity of a single- knob Champ through the Bandmaster and Deluxe - with virtual jack leads to bridge the channels for more tonal options - to the rare 40-watt Twin. And if that’s not enough tweed, the Bassman offers the option of calling up a new or worn-out model. Then there’s the Super, with its cool reverb and tremolo, delivering bright, spanky tone through its 4x10-inch speaker cab. Whether mixed and matched with other AmpliTube gear or simply used purely for Fender sounds, this is an excellent package featuring classic amps that have been at the foundation of many genres of popular music since the 1950s, and are every bit as valid for today’s recordings.